Since our founding in 1975, we have been fascinated by the purity, elegance and aging potential of Pinot Noir grown on mountain vineyards. In 2015, our appreciation for the depth and complexity of these wines led us to Muns Vineyard in the Santa Cruz Mountains. Located above the fog line at 2,600 feet, Muns Vineyard has an ideal south-facing aspect that looks out over the Monterey Bay. While the site benefits from abundant sunshine, the high, windswept location lengthens the growing season, while producing thicker grape skins. 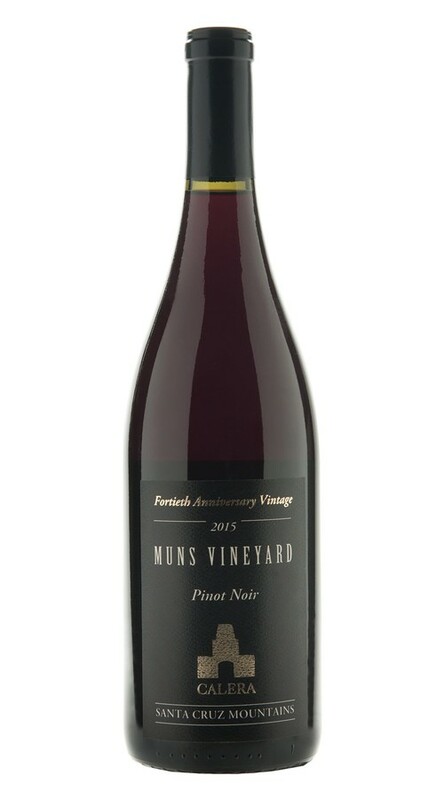 With its high elevation and southern aspect, Muns Vineyard has produced a beautifully structured Pinot Noir with alluring aromas of black plum and Bing cherry. On the palate, robust tannins frame the voluptuous fruit flavors, with hints of charcuterie, nutmeg and earthy forest floor adding depth and complexity to a lingering finish. Though the 2015 growing season resulted in the earliest harvest ever at Calera, the quality of the vintage was exceptional. A dry winter, with little rainfall, marked our fourth year of drought, contributing to lower yields and smaller, more concentrated grapes. Budbreak commenced unusually early, in the last week of February. Our Muns Vineyard vines reached full bloom by mid-May. Summer was mild with consistent morning fog, and harvest began on August 17, with our grapes displaying elegance, earthy spice and excellent natural acidity.